These options allow you to manage the look of the videos on the Classic / Classic 2 (fixed height) / Mixed list / Stream (gif’s and memes) listing types of the pages. 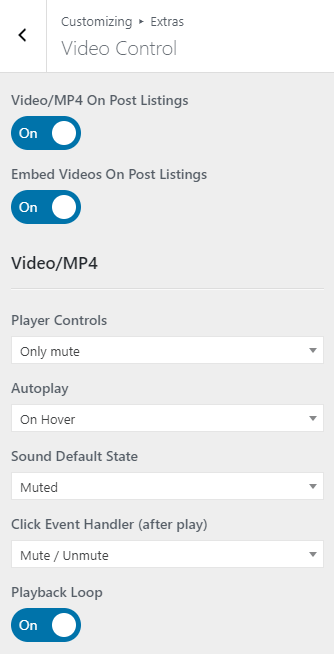 These controllers are applied to the videos advanced through Boombox Post Advanced Fields metabox or through video post type of Zombify plugin. To manage Video control options please go to Customizing ▸ Extras ▸ Video Control. choose what will happen after play, when user click on event handler: Mute/Unmute sound or Play/Pause video. ON/OFF – move trigger to ON if you want to play the video infinite time. Please note: Video/MP4 section options work only for for uploaded videos. That options doesn’t available for embed videos.